At Webfoot Outdoors and Rimrock Kennels, we appreciate those who share our passion for dogs. For us, life is all about training great dogs, enjoying good hunting, and building lifelong friendships all while doing what we love the most. 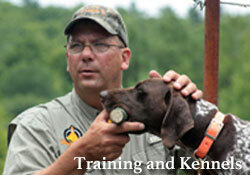 Webfoot Outdoors is proud to have achieved the Huntsmith Foundation Level Trainer Certification. This training program has completely changed the way we do business. The proof is in the quality of dogs that we have produced in the past year implementing this training philosophy. We will be offering seminars annually by Rick Smith on both the foundation and intermediate levels of this system. We highly recommend attending. Click HERE to learn more and to register today for this year's seminars. Train as you hunt is the key to a successful finished gun dog. Whether you have a high energy pointer or an all business retriever, we can help you get the results that you’re looking for in a hunting partner or a family companion. We also offer basic and advanced level obedience training, as well as a full service boarding facility. 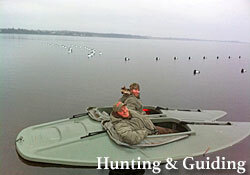 Our mission is to provide you with a professional, safe and quality hunting experience that you will not soon forget. 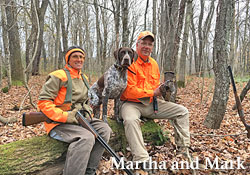 We are proud to offer our hunters some of the best of waterfowl and upland bird hunting opportunities in the North east. The St. Lawrence River Valley holds a large variety of waterfowl and the highest Ruffed Grouse and Woodcock flush rates in the state.